Summer squash and herbs in parchment. The dish that finally sold me on summer squash. A couple of weeks ago, my sweet boyfriend gave me some homegrown squash (along with some other veggies). I didn’t have the heart to tell him that I don’t like summer squash. But then I chose to reframe it as an opportunity to change–or, at least, revisit–my opinion. On my way to the grocery store, I checked my “How to Cook Everything” app for a good squash recipe and found the summer squash and herbs in parchment (also in HTCEV). With its few ingredients, simple preparation, and promise of tastiness, it looked like a perfect unemployed-girl recipe! And it was. After roasting a chicken last night, I popped these squash, onion, and herb-filled parchment packets into the oven, and 20 minutes later, had a sweet, flavorful side dish by the time I carved my chicken. I’m sold. Note: The basil I bought for this recipe had already gone bad, so I used rosemary and fennel (to get the licorice flavor of the tarragon that Bittman’s recipe suggested). I LOVED the fennel. It really contributed to the summery sweetness of the dish. 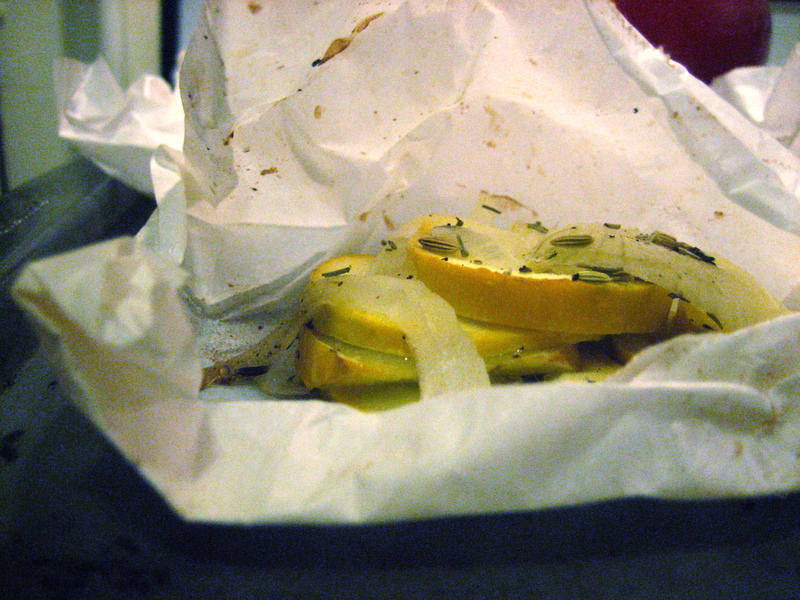 Summer squash and herbs in parchment, HTCEV, p. 362. 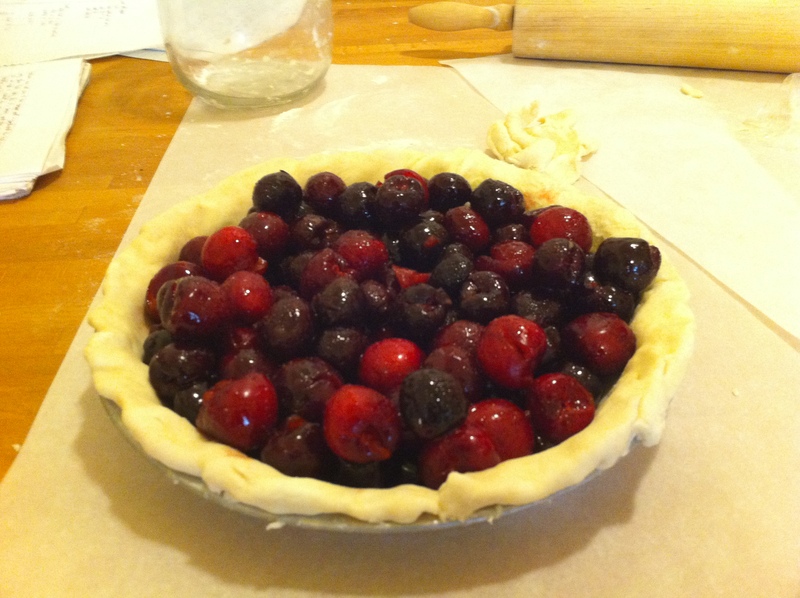 The cherry pie, in progress. Note: I’ve been clearing through my Draft posts folder, hence the deluge of “new” posts. When I moved from Portland to San Francisco, I drove Wolfie, my 1990 VW Golf down I-5 through Oregon, then over to the coast, stopping along the way for coffee and cherry pie (I may or may not have been inspired by Twin Peaks). I honestly feel that there is no more perfect pie than cherry pie. The round whole cherries bobbing about in that bright-red syrup and popping in your mouth as you eat them–delicious. So since this summer has turned, somehow, into the Summer of Pie, it was only logical that I try my hand at a cherry pie to bring to my friend Angela’s jam up in Fiddletown. Step 1 in making cherry pie: Clear your calendar. Once you do free up several hours of your time, bear in mind that it will likely be on an uncharacteristically gorgeous day when you’d really rather be doing something outside. That’s OK, because soon you will enter the Zen state of cherry-pitting, and that is something that all those people hiking, biking, sunning, eating at charming outdoor cafes, etc. will not be able to enjoy. Nor will they be able to eat your pie. The pie, about to go into the oven then, soon after that, into my belly. 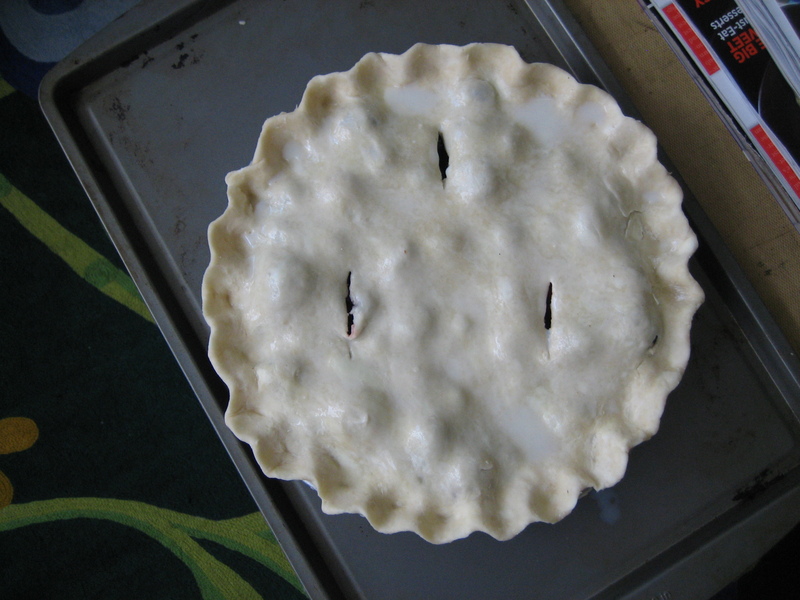 Other than that, I followed Bittman’s recipe (of course) for cherry pie. I used sweet cherries from my local farmer’s market and added lemon juice and almond extract. This was, I must say, my best pie ever. 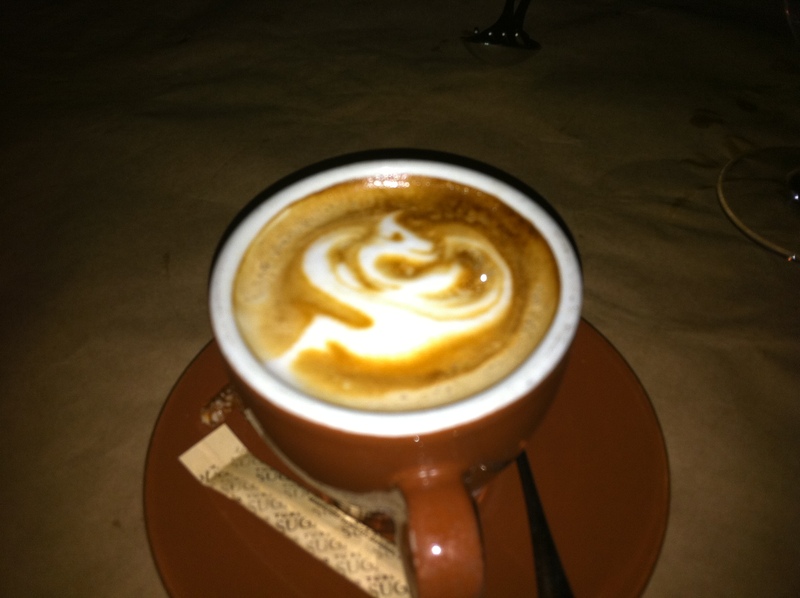 A cappuccino from A16. If trying this at home, actual results may vary. Thanks to the cutbacks at my company, I have recently found myself with lots of free time on my hands. What’s a girl to do? Learn some new skills, of course, to not only make myself more hireable (learn Google Analytics) and to invest in my personal development (polish up my French, exercise more), but also to impress my friends with otherwise useless skills and/or knowledge. I’m chronicling the useless skills bit on this blog. First up, the skill that perfectly balances inutility and impressiveness: latte art! Lessons learned: For those who want to learn how to make latte art, the Internet is full of good information. A quick search on YouTube turns up a ridiculous number of videos of baristas showing off their techniques (this one is particularly good). One key–but often omitted–detail is that the crucial element to making good latte art is the quality of the foam. It seems obvious, but after a few failed attempts with my Bialetti Moka coffee and my Bodum milk frother, I realized that not even a mastery of the coffee pouring technique could help me turn my latte art, which somewhat resembled milk-and-coffee fingerpainting, into Louvre-quality. I had the wrong equipment. This feeling was confirmed when I read CoffeeGeek’s comprehensive explanation of milk frothing. You need an espresso machine to make artist-quality milk microfoam. And not just any espresso machine–one with a high-end frother. And not only that, you need to know how to properly wield your particular frothing attachment to achieve the tiny bubbles and pourable consistency required of latte art-quality foam. CoffeeGeek’s frothing tips look like they can take you from n00b to home barista. Sadly, my disposable income prevents me from getting an espresso maker, not even the adorbs and relatively inexpensive Francis! Francis!. Even more sadly, I am not related to anyone at the company that makes the Solis SL-70. 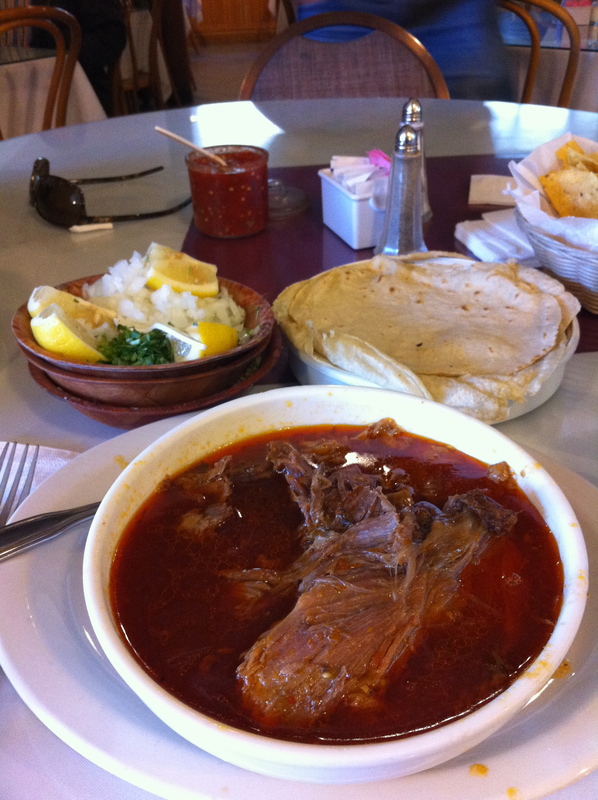 Birria, or lamb stew, from Gallardo's Mexican Restaurant. Look at all that yummy meat. Gallardo’s, on Folsom near 14th, is in the middle of a strange gourmet ghetto: part gourmet (Nihon, Chez Spencer), part ghetto (central freeway, Best Buy). I walked in, looked around the dimly lit dining room for Oggy, and then decided to wait outside. When she arrived, the waitress told us to take two seats at a six-top, right next to the large neon jukebox, which occasionally sprang to life, playing a solitary song just to remind everyone that it was there. There were exactly four gringos in the place–us and two hipster dudes who were probably also Tasting Table readers. We both ordered the small birria ($7.50). Unlike Tasting Table’s, our stew had the lamb already in the broth. We briefly wondered if we had the gringo version. The three stacked wooden bowls contained crushed red pepper, oregano, and an assortment of wet condiments: diced onion, cilantro, and small lemon wedges. “It’s like Mexican pho!” I said. A friend of ours swears by the post-night-of-drinking restorative qualities of pho. The birria would be a great alternative for those mornings when you were debating between greasy bacon and eggs to sop up all the toxins you willfully introduced to your system and healthy pho to wash them all out. The almost brick-red birria broth is meaty and substantial, as opposed to the clear-tasting pho broth. As my fork barely scraped the huge chunks of lamb, the tender, juicy meat just fell right off. After drinking about half her iced tea, Oggy realized what was different about it (besides the noticeable layer of sugar sitting in the bottom of her glass): it had been made from hot brewed tea that was then iced. A nice touch. Oggy and I devoured our birria, yet each of us only managed to make it through about half of a small order. I wish I had taken the rest to go. Oh, that broth! 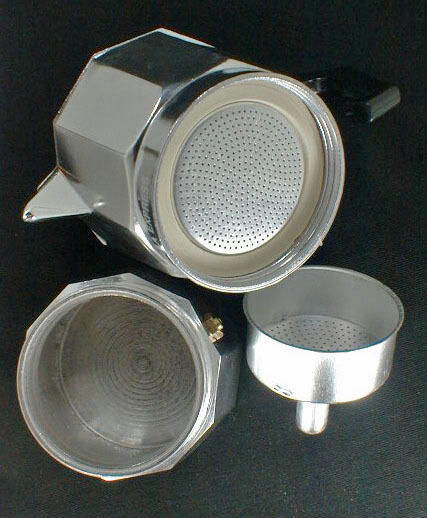 The inner workings of a stovetop espresso maker, or macchinetta. The gasket is the white circle in the bottom of the pot. Photo from Fante's. The gasket recently fell apart–literally–on my Bialetti Moka. I bought it (along with a Bodum milk frother) about 7 or 8 years ago after reading a Martha Stewart Living article on making perfect espresso at home, and it’s been my only coffeemaker ever since. I have the 9-cup size, and it makes just the perfect amount of coffee to fill my OXO travel mug or to make myself and one other person a cup at home. But after 7 or 8 years of near-daily use, the gasket was literally disintegrating. I tried to pry it out, and it crumbled out in chunks and flakes, making it difficult to measure the diameter of the old gasket. After quite a bit of trial and error, I figured out how to find out what size I needed. 1. Pry out your gasket with a dull knife or a screwdriver. It will be wedged in the top in a little groove, so you may have to muscle it out. If it comes out intact, great! Measure the outside diameter. Gourmetdepotco.com has a handy guide to measurements and gasket sizes. 2. If it doesn’t come out intact, measure the inside diameter of the spot where the filter and gasket rest. Bear in mind that this will not give you an exact measurement, since the gasket rests inside a groove. For example, mine measured 3 1/16″, but the gasket I needed was 3 3/16″. If your gasket was falling apart, well, two things: First, you should replace it more frequently. Second, you’ll need to scrape out any hardened bits from the grooves or else the new gasket either won’t fit or won’t seal tightly. 3. Buy the size you need. I initially ordered one from eBay, but when after two weeks, it had not yet arrived, I went to Sur La Table and picked one up. The 6-cup gaskets are $1 each and the 9-cup gaskets are $4 (!). You can also buy them on Amazon ($6.89 for a filter and three gaskets, not shipped through Amazon) or from Fantes, a Philadelphia-based kitchen supply store with a really informative website. 4. Place the gasket around the filter, then place the gasket and filter in the macchinetta. Just as you had to pry the old filter out, you’ll have to wedge the new filter in. Take a butter knife or other dull knife and press the gasket into the grooves in the macchinetta’s side until it’s resting more or less flat. 5. Make some delicious coffee, and pride yourself on your minor but meaningful accomplishment of the day. Also, if unemployed, rejoice in the money you’ll be saving! Your coffeemaker doesn’t seal properly, causing the quality of your coffee to decline. What exactly does this mean? For me, the coffee would sometimes only brew halfway, and it would be a thick, viscous mess, not unlike motor oil. Steam may begin to leak out between the top and bottom parts of your macchinetta. The gasket will start to look cracked or in otherwise bad shape. There are several items still on my “To buy-home” shopping list: a Le Creuset cast-iron skillet, a side table for my couch (this is currently the top contender), etc. But one thing I have really wanted are champagne coupe glasses so I can serve my Sazeracs and gimlets just like all the cool cocktail bars do. 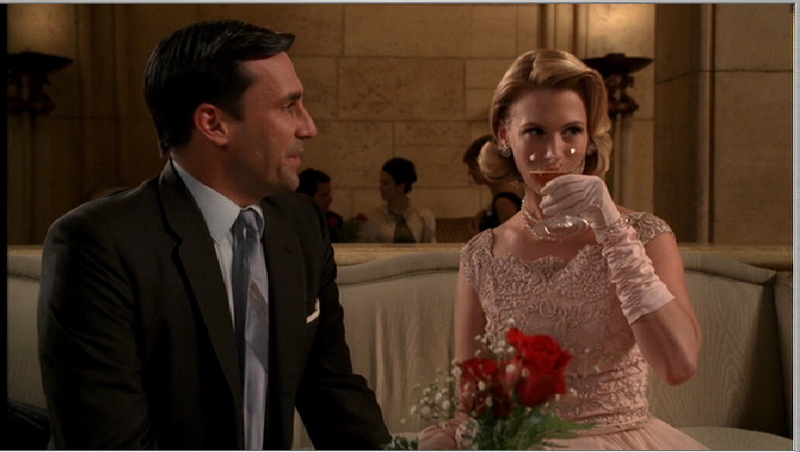 Also, just like Betty Draper held when Don took her to the Savoy for Valentine’s Day. Would Don and Betty look this stylish if she was drinking out of a flute or martini glass? No. Of course not. If you, too, are moderately obsessed with champagne coupe glasses, here is the best online source I’ve been able to find, provided, of course, that you want 36 or more of them. 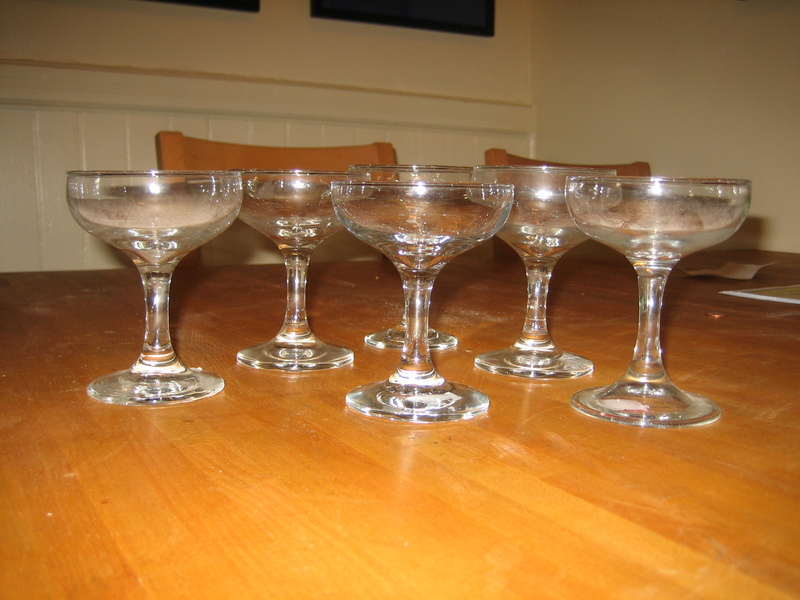 I wandered into Community Thrift Store on Valencia yesterday and hit champagne coupe paydirt. I found a pretty big variety of styles, including set of 6 or so coupes with fancy stems. I briefly considered buying 12, but decided that my current financial state called for restraint. I chose ones that look like Libbeys: 3 in the 4.5 oz. size and 3 in the 5.5 oz. size–all priced between 50 cents and $1.50. Kind of boring, but it was also only $10 at a yard sale. 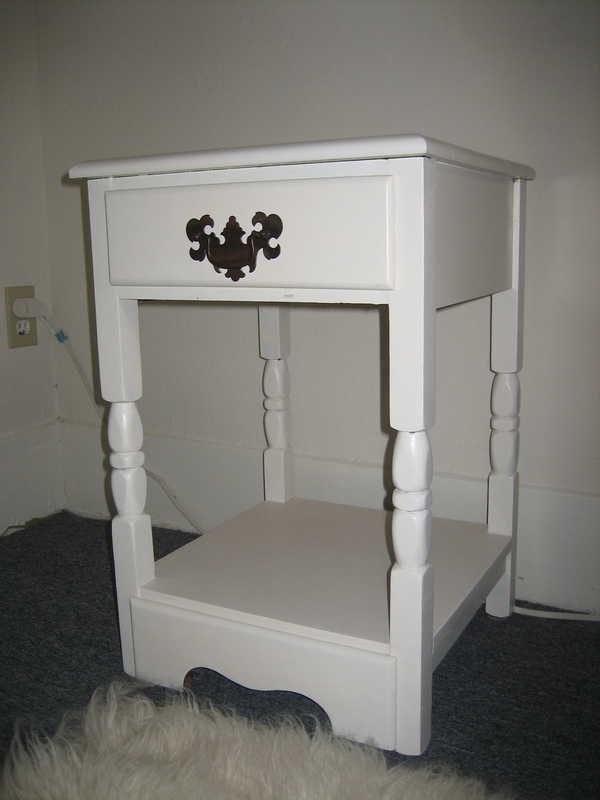 And a week or so ago, as I was walking home from the SFStreet Food Festival, I picked up a little nightstand. I didn’t love it, but I liked it, and as I was about to walk away, one of the sellers said, “Luis! How much do you want for this nightstand?” “$10!” Luis called back. “I was going to ask more, but I don’t want to bring it upstairs.” Sold. I think I’m going to strip it, stain it in a dark grey to actually bring in some of the dominant color from my bedroom-redesign inspiration, and swap out the handle with something like this (in red) or this. A few weeks ago, I was chatting with Pat, who has spent the last two summers building planter boxes and planting vegetables and flowers in our formerly city-sparse concrete-covered backyard, transforming it into a peaceful garden where tasty and beautiful things grow. 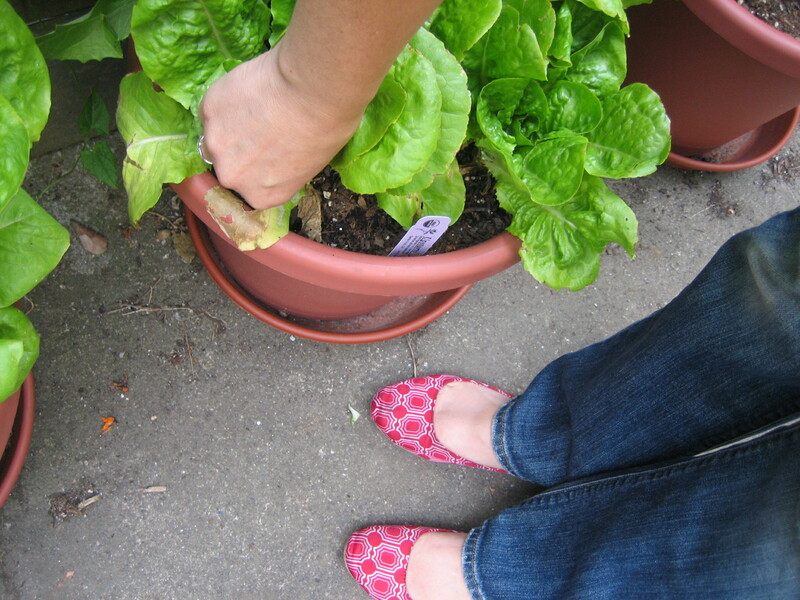 Pat invited me to pick as much of the lettuce that he’s growing as I’d like. “Isn’t it amazing how that works?” I said, thinking of how my friend grew to appreciate deer once she realized that the plants in her garden that they nibbled on were the ones that were thriving. “A lesson in abundance,” he said. I’ve been thinking about that a lot since I was laid off a few weeks ago. The morning before I was laid off, I found out that my dad has cancer. My biggest concern was getting the time off to come home and see him. When I heard that my position had been eliminated, my main thought was, “Problem solved.” I worried about work, and after sending out a few emails, ended up with three freelance assignments and offers from friends who were already looking out for me. After some plans fell through, my new (fabulous) boyfriend found himself with a free vacation week not long after I found myself with this abundance of time. We took our first trip together. Actually two. I took the opportunity to host a French woman through CouchSurfing. She used to live in the United States. She was married and had a child, but couldn’t find interesting work and developed a series of health problems. When the doctors here told her she might have MS, she knew she had to make a change. She moved back to France with her son and started her life all over again. With her new job, she is able to travel–fulfilling a lifelong dream. Her health problems have disappeared, and she uses Skype, email, and other technological tools (as well as side trips on her business trips) to make sure her ex-husband stays actively involved in their son’s life. We talked about how sometimes you have to give up everything in order to get the life you want or need. You have to allow creative destruction to happen, and to do so, you need to believe in an abundant future. I don’t know how I’ll feel in a month or two, but right now, for the first time in a long time, I believe in an abundant future.